My brain does still work!! Leaving school at sixteen and making my way to college, full of teenage gung-ho and raring to go. A young head with lots of confidence and ambition, yearning to learn with a longing to meet new people! I completed and passed with merits and distinctions, a two year Beauty Therapist course, upon leaving I planned to further my education and because of my passion for the human body and it’s anatomy, I decided wanted to become a physiotherapist. 1990 – A long time ago. Fast forward 28 years and it’s been quite a different life story to the one I had planned. I met a boy! Marriage, babies, living abroad, all took my life in a completely different direction. Do I regret it….of course not! I’ve had a blast. I was privileged to be able to be a stay at home mum and worked part time in the hospitality trade. The children grew up, I stayed working in hospitality but now full time. Years of doing the same job, thinking it was all I could do and I believed that was all I was good at. Then, last year, a friend, in a passing conversation, unveiled a new opportunity to me. It would mean dipping my toes back into the world of beauty and working for myself. After weeks and lots of deliberation, I decided to take the plunge. Terrifying! But, I trained, did my online course and realised that, at forty-five years old, my brain that for years hadn’t been overly tested, still worked! I passed the practical course and low and behold, suddenly, I was a spray tan professional, running my own franchise with Wilde About Tan! With no experience of marketing a business, I struggled with the notion of getting my message across to bring in new business to an area I am unfamiliar with. Even I have shocked myself at times at my apparant lack of confidence, especially considering I oozed it in the hospitality trade. But, I’m learning, slowly becoming more self-assured. It’s a slow road but every day I’m achieving something new. Turns out I’m only human. I’ve taken a further step into the beauty world and knowing that my noggin’ still has the capacity to learn, I am currently enrolled on a Nail Technician Course and loving every minute. My first course is acrylic nail extensions and I’m excited and proud to say that so far, it’s going extremely well. I am a perfectionist, so those of you having a spray tan with me, are safe in the knowledge that I will always strive to leave you looking and feeling fabulous. The downside to being a perfectionist is that I can also be highly critical of myself but that also means that I persist in achieving the best work in everything that I do! Great news for my clients as I take immense pride in all aspects of my job. Forty-five years old, writing my very first blog, more courses and learning planned for the months ahead and I’m loving the challenges, new knowledge and skills I am learning. The brain, as I’ve learned, can become stagnant. Not anymore. You can teach an old dog new tricks after all!!! 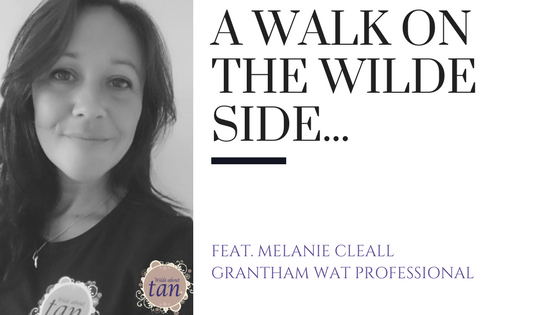 You can now book with the fabulous Melanie C Here!